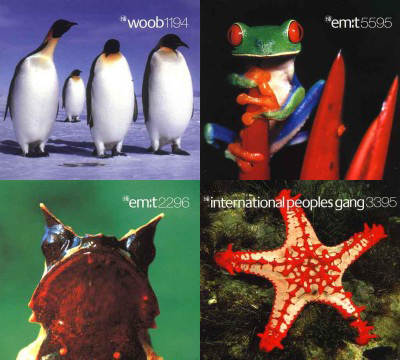 em:t Records, based in Nottingham, UK, defined ambient notions of the mid-90's through a series of genre-bending albums which sought to quietly undermine quick, disposable, chemically-sodden club culture. Despite an untimely exit from the music scene - and another entrance and exit in the 2000's - the music released on this defunct label helped to crystallize a special musical synthesis which still grabs the attention of collectors today. 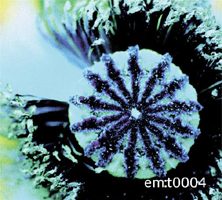 Especially on its compilation releases, em:t blended together found sounds, organic dub rhythms, and highly-processed digital musical motifs into a unique aural portrait. The core team of artists and engineers who would help get em:t off the ground began in the same studios with the label t:me. 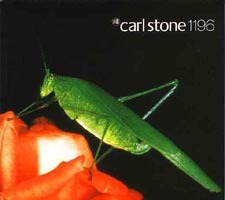 Beginning in 1992, t:me released vinyl singles which later grew to double-packs, featuring club music which tied together deep house, downtempo and tribal house with a bit of a jokey English twist. Early artists to come to the label included Moodswings, Chicago house king Chez Damier, and 20:20 Records owner Ralph Lawson. A few artists would later find their way to em:t, such as Mat Jarvis, Charles Webster, and a couple choice members of O Yuki Conjugate. Almost two years after t:me's first release, em:t was created as a sub-division of t:me, to provide a collectible series of high-quality CD releases aimed at "enquiring minds in an anxious age". Producers and label bosses David Thompson and Chris Allen sought from the beginning to release music which moved, becalmed and unsettled the audience. Along with an wide-ranging approach to selecting artists and compilation tracks, em:t also mastered its CDs with the relatively new Roland Sound Space 3D processor, which endeavored to duplicate quadraphonic effects on stereo speakers. Instead of the aggresively-mastered sounds of club music, em:t strove to be deliberate and thoughtful in their music, and pleasantly obtuse in their press material. Sheffield-based graphic design firm The Designer's Republic created a "look and feel" for each disc which made the series recognizable - sparsely-placed textual elements with sharp, colorful cover images of wild animals. Titles were limited to the artist's name and a four-digit number indicating the disc's year and placement in the em:t discography. The simple details of em:t's packaging belied the variety of the music inside. Between Thompson, Allen and engineers Tom Smyth and Will Joss, many releases were sequenced, mixed, mastered, and in some cases written by the same close-knit team with the same open-minded vision. The reputation of em:t received a major boost with its early series of solo-artist albums from Gas, Woob, Miasma, and Qubism. A fusion of styles was brought to the fore which was complex without being cluttered. Ambient house, ethnic techno, dub reggae, musique concrete, new age and minimal music were parts of the em:t sound, which was also replete with spoken samples from Italian horror movies, French poets, clacking billiard balls, Star Trek, the videogame Doom, and cellist Yo-Yo Ma. The original run of em:t releases spanned eighteen discs, many of which were multi-artist compilations combining artists from the worlds of dance, dub, jazz, psychology, and sound collaging. Releases from Miasma, Gas, and Undark were more melodic and direct, while discs from artists like Beatsystem and Natural Language went softer, heavier on samples and field recordings, more abstract. At least partially because of its small size and desire to put creativity above commercial concerns, t:me and em:t were brought down by financial difficulties in early 1998. Its artists took up shelter elsewhere or disappeared into semi-legendary territory. In 2003, em:t reappeared under a new set of producers, engineers and designers who sought to carry forward the same aesthetic with newer sounds. A few very successful compilation albums came out, followed by albums from Seattle-based artist Gel-Sol and his group 302 Acid, which were strong word-of-mouth hits. "Classic" em:t artists Gas, Beatsystem, and International Peoples Gang returned to contribute more music to the new em:t, which again went under quickly and quietly after only its seventh release. Between the old and the new catalogues, twenty-five musical documents form a compelling, colorful, and sometimes frustrating musical portrait. Microtones, scratches, whispers, and dusty found sounds mix with soaring, sky-high techno symphonies, challenging the minds of attentive and open-minded listeners, even today.